We've all been there and experienced that — a surge of triumph and borrowed glory as a few good-looking Hollywood actors pulled off a thumping victory in a blisteringly fought war with the bad guys. Movie after war movie, the American brand of heroism has been so deafeningly choreographed on the battlefield that the blood, gore and brutality of war has turned into pure entertainment for the masses. This brand of heroism that America got the rest of the world hooked on to disturb many of its people today, including Nina Huntemann, associate professor of communication and journalism at Suffolk University in Boston and co-author of Joystick Soldiers: The Politics of Play in Military Video Games (Nina B. Huntemann, Matthew Thomas Payne). The fact that she is a video game expert herself ("My dad brought home an Atari 2600 when I was eight") makes this heroism more alarming for her. Prof Huntemann's area of speciality is the political-economic relationship between the military and entertainment industries and the ideological connect between popular culture and military action. In a paper she presented in Boston in 2010 titled Structure: Militarism and Video Games, she said, "[US] policy-makers send troops into action, but before that we need to have a culture of consent. The people need to consent to our government participating in war. To do that, we need a whole process of teaching us from childhood that killing is a legitimate mode of conflict resolution." One of the most powerful tools in shaping this consent is war video games with which the US has, for decades, enjoyed a torrid love affair. America's need for soft propaganda to legitimise going to war goes back to WWII when the US War Department reined in noted Hollwyood film director Frank Capra to make seven films "to garner support for US participation in conflict." Capra's Why We Fight series were shown before features in theatres, and were also used to train draftees. "It was a propaganda piece and understood as such," Huntemann said. Since then, the US propaganda machinery has become much more sophisticated. This sophistication, however, is more the need of the hour than an indulgence. Today's media audiences, Huntemann said, are an extremely savvy lot. "We have decades of experience reading media, detecting lies and knowing when we are being sold one. As such, any persuasive appeal must be far subtler in its approach." But post 9/11, the subtlety started to look like needless window dressing. There was no more reason to be coy about the need to go to war. "We are at a place [now, since 9/11] where war, for Americans, has become perpetual and part of the landscape. This has been, in part, a result of media content saturated with stories of war and conflict, both real and fiction," she said. Enter video war games and their role in shaping attitudes about conflict. In their inherently one-sided dimension as vehicles of voyeuristic battle, video games are, understandably, unable to go beyond their blueprint. Huntemann said, "War-themed entertainment media, especially media that tells heroic stories from only one side of a conflict, participates in glorifying war. When we glorify war and conflict, we tend to push aside important questions about the consequences of warfare." This is where ‘soft propaganda' comes in. "The purpose of soft propaganda," according to Huntemann, "is to persuade the public by telling stories that seemingly have universal appeal and where the sides of "good" and "evil" are unquestionable." One simple way to achieve this, she said, is to reduce the story of conflict to the actions of one heroic person. In the case of video games, this heroic person is the player. The relationship between the military and the entertainment industry, according to Huntemann, is an old and symbiotic one. The first video game, SpaceWar, was launched in 1962. In her paper on Structure: Militarism and Video Games, she said, "Quick history, and an arguable history, is that video games came out of the Hingham Institute Study Group on Space Warfare, funded by the Pentagon. The PDP-1 [the world's first commercial interactive computer, Programmed Data Processor One] showed up and in 1962, and the Institute was told to do something with it. One of the students Steve Russell, along with his team, created the now infamous SpaceWar. The precedents of tabletop battle simulation led to a simulation of battle on the PDP-1. It was essentially a pretty good missile simulation… This was very interesting to the Pentagon at the time." It was also the start of an extremely mutually beneficial relationship between the US military and video gaming. 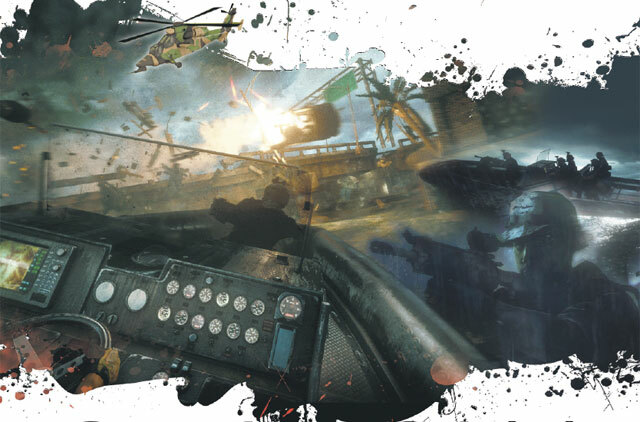 In the ‘military-entertainment complex' as Huntemann terms it, the ability of the video gaming industry to interpret tactical battlefield situations and use of weaponry in more dynamic ways gains an edge over what typical military strategists can conjure up. "The military is not interested in working with game developers to put games out there that are pro-military per se. Instead, what is interesting to the military is the capability of video games and of computers generally to simulate," she said. The phenomenal progress in the science of simulation over the decades has only made the symbiosis of the two industries more inevitable. "When there is so much money and resources going into the commercial sector, it offers an opportunity [for the military] to share technology that works well for it. It's simulating reality that the military is most interested in when trying to adopt or adapt, or both, video games technology for their training and warfare purposes," Huntemann said. The outcome of this collaboration, however, has led to a deeply disturbing reality for many Americans — a disconnect with the harsh truth of war, death and destruction. Video wars deal with conflict and the dynamics of war in a way that is far from the exact truth but it is easy to see why they do so. Such narratives, according to Huntemann, "help you evade the complexities of war, of tackling the reality of how it is created and conducted by a very large organisation with many political actors in it." A war is not like it is depicted in the movies where a few young, strong, good-looking men blaze into the battlefield and kill the bad guys. Similarly, a video game, played in the comfort of your den, may offer you some long moments of heroic pursuits but the heroism is more a fantasy than reality. Beyond the "socialising power" that video games possess, the realism of simulation they offer as a commercial bait, Huntemann said, leads to a "pedestrian understanding of history rather than a deep understanding [of it]." And given the state of perpetual war that America willingly imposes upon itself, it remains to be seen whether the true import of war will ever disengage itself with the lure of play. Medal of Honour (MoH): Airborne, one of the series, was developed with a historical advisor to ensure accuracy. The audio was recorded from hundreds of real WWII era weapons and tanks. One of the last remaining C-47s was used to create sound for the game. In Medal of Honour (MoH), the attention to detail is staggering. To make the sound of soldiers running as authentic as possible, real US and German Army-issue boots were used to record the two sets of sound. Steel Beasts: It is perhaps the world's most successful tank-training simulator. After its launch in 2000, it has been used by the US military and the armies of Australia, Denmark, Finland, Norway, Spain and the Canadian Air Force to name a few. America's Army is a free online simulator that was published in 2002 to aid recruitment. Start Thinking Soldier is British Army's online game launched in 2009 to drive interest in the Army in 16-24 year-olds. Glorious Revolution is an online game China's People's Liberation Army launched in 2011 for both its military and domestic markets.